Tag Archive | "Classical music"
There is longevity in being positive. Delegates in a super thinking session at our Spanish course. Be positive… for your good health and for the health of those around you. According to an article in the Journal of Personality and Social Psychology entitled “Positive emotions in early life and longevity: Findings from the nun study by Danner, Snowdon and Friesen”, positivity can have an impact on longevity. An abstract of the article says: Handwritten autobiographies from 180 Catholic nuns, composed when participants were a mean age of 22 years, were scored for emotional content and related to survival during ages 75 to 95. A strong inverse association was found between positive emotional content in these writings and a risk of mortality in late life. As the quartile ranking of positive emotion in early life increased, there was a step wise decrease in risk of mortality resulting in a 2.5-fold difference between the lowest and highest quartiles. Positive emotional content in early-life autobiographies was strongly associated with longevity 6 decades later. 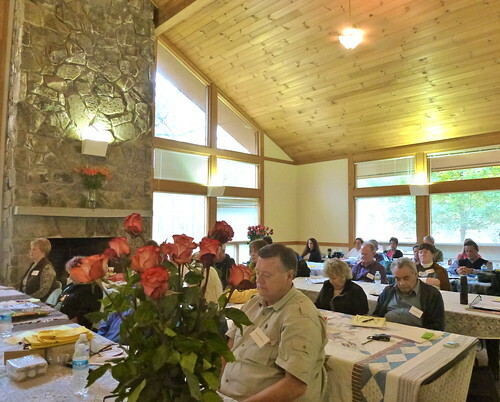 Delegates in a Super Thinking session at a Writer’s Camp. This is also why we use Baroque Music in the Super Thinking workshop to help inflate IQs and relieve stress at the same time. Super Thinking creates a state of relaxed concentration and reduces stress. But one might ask how does this work? Negativity and stress can be created by insufficient serotonin. An article at women’s health.com entitled “Negativity and Your Health – How Stress Can Make You Sick” says: Stressful environments. Jobs that impose high demands for output of services or products but allow workers little control over how those demands are met have been termed high-strain jobs. Psychologists Robert Karasek, PhD, of the University of Massachusetts, and Tores Theorell, MD, PhD, of the Karolinska Institute in Stockholm, Sweden, have documented that people working in high-strain jobs are more likely to develop high blood pressure, infections, and job-related injuries, as well as heart disease. This clustering may be the result of reduced brain levels of the chemical serotonin, a neurotransmitter that nerves use to relay messages to one another. When serotonin levels are low, we are more likely to be angry, depressed, and anxious; to be less interested in relating to other people; to have greater fight-or-flight responses when stressed; and to smoke, drink, and eat more than is good for us. If true, this theory could point to the brain’s serotonin system as a key neuro-biological mechanism that regulates our ability to be in control. Two studies have found weaker brain serotonin function in persons with lower income and education levels. In his most recent research, Redford has begun to study how genes that are involved in regulation of serotonin affect all of these health-damaging psycho-social, biological, and behavioral characteristics. Delegates in a Super Thinking session at our Investing and Business Seminar. How are Baroque Music, Super Thinking and serotonin connected? An article at classical forums. com entitled “Effect of Classical Music on the Brain” helps us understand the connection between Baroque Music and serotonin. Here is an excerpt (bolds are mine). Classical music affects the brain’s organization and abilities, through its melody and rhythm. The rhythm raises the level of serotonin produced in your brain. Serotonin is a neurotransmitter, involved in the transmission of nerve impulses that helps maintaining joyous feelings. When the brain produces serotonin, tension is eased. In fact, depression is a consequence of the scarce production of this hormone. Serotonin is released when the brain is “positively shocked”. For instance: if we look at a splendid painting, smell a delicious scent, feel an extraordinary sensation, eat something delicious or listen to some charming music, then the brain lets off a certain amount of serotonin which arouses and maximizes pleasant feelings. Music’s rhythm can also stimulate other natural cadencies of the body, resembling the heartbeat, or the Alfa-rhythm of the brain, and this effect is used to counter the development of clinical depression. The melody instead, is the “sparkle” that catalyses the creative process in our minds. One way we become more positive is with music. Music opens our awareness in different ways depending on the type of music. I am not sure anyone knows entirely why…but music has been used by cultures almost since time began. The use of music can run from romantic to a military march to patriotic songs to music that helps us exercise better. One fact about music that is known is that certain types of music affect humans in the same way regardless of color, race, religion. Sad music makes all people sad. Happy music makes all people happy! Here is an excerpt: Researchers have identified the optimal tempo for music to improve exercise and shown that music can increase oxygen intake and stamina. WSJ Your Health columnist Sumathi Reddy reports. Research has found that at the right tempo, music can reduce the sense of exertion as well as boost motivation. Costas Karageorghis, deputy head of research at the School of Sport and Education at London’s Brunel University, says the “sweet spot” for workout music is between 125 and 140 beats per minute when people aren’t trying to time their movements to the music. Previously, experts believed that the faster a person exercises, the faster the music tempo should be. Other new studies have shown that when athletes synchronize their movements to a musical beat, their bodies can handle more exertion: Treadmill walkers had greater stamina and cyclists required less oxygen uptake. And swimmers who listened to music during races finished faster than others who didn’t. Music can help you work out. Music can also help you learn and know more. To gain from these facts, Merri and I listen to 60 beat ten cycle classical music recommended by Dr.Georgi Lozanov, the great Bulgarian educator. You could count the number of times we have missed our meditation routine in the last 20 years on one hand. The frequencies in silence, meditation and music have been proven many times, in many ways to improve health and intelligence. The system Lozanov utilized of three types of music in three phases to enhance absorption, retention and recall. The first phase uses introductory music, along with deep breathing exercises, for relaxation and to move the mind into an Alpha state. This is where the health benefits seem to begin as well. Blood pressure can drop, heart rate slows and the mind becomes calmed. Next an active concert is heard. At this stage, the information to be learned is read. Finally, a passive concert is used as the new information is again reviewed. This baroque music and its beat help put the mind in a state where the information absorbed shifts into long-term memory. For example, here are some ideas and music that can improve your health and intelligence and how to research some new idea or study something new. This process tunes our minds into nature’s deeper wisdom, tunes us into the wisdom of silence where the noise of our logic is not heard. This creates what seems to be extraordinary intelligence but is really just taking us to the deeper levels of wisdom we all (as creations of nature) possess. Being positive is good for creativity, happiness and longevity…whenever you work or learn, it’s a good idea to find a way to gain super thinking and positive good health! See how we use Baroque Music to learn Spanish in three days. Learn Spanish in three days at the all-inclusive Sheraton Bijao Beach Resort on Panama’s Pacific coast. Speaking Spanish is a huge benefit on its own. 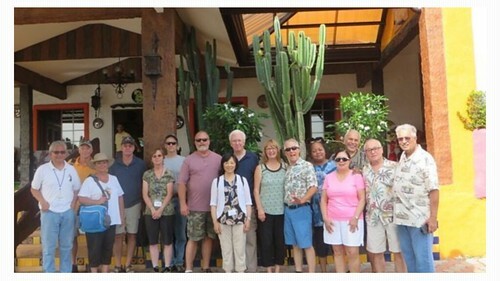 You can become one of the rare North Americans who can get along in Spanish speaking countries. You can be one of the special people who can communicate with 10 million non-English speakers in the USA. Spanish is the second most used language in the USA. There are more Spanish speakers than speakers of Chinese, French, German, Italian, Hawaiian, and the Native American languages combined. According to the Census Bureau, Spanish is the primary language of nearly 50 million people in the US. This is the largest Spanish-speaking community outside of Mexico. Only half of these speakers also speak English “very well,” and 19% do not speak Spanish at all. This is why you might want to visit Ecuador or Panama and learn Spanish in just three days. However, there is a scientific method of learning… proven and described in numerous best selling books that create educational jumps by making education natural, easy and fun. This course works because it is education without stress! The first tactic is to use Baroque music in the learning process. At least three best selling books, “Superlearning”, the “Mozart Effect” and “Superlearning 2000” have revealed insights about how to learn and think more powerfully based on systems drawn from the Bulgarian educational master, Dr. Georgi Lozanov. Merri Scott was among just a few who learned directly from Lozanov. Learn Spanish at the all-inclusive Sheraton Bijao Beach Resort on Panama’s Pacific coast. Super Spanish teacher, Rick Brown, will be teaching this Super Spanish course December 5-6-7, 2017. The course fee (travel and hotel not included) is $349 or $499 for a couple. Enroll – Bijao Beach Spanish Course $349. Enroll for Two – Bijao Beach Spanish Course Couple $499. 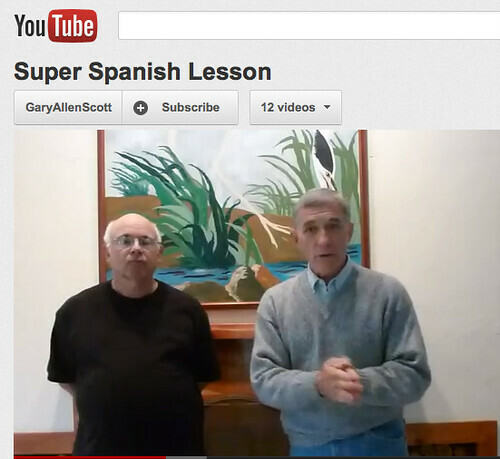 Rick Brown, Super Spanish teacher. 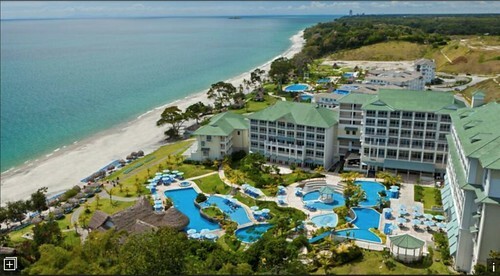 The course will be conducted at the all-inclusive Sheraton Bijao Beach Resort on Panama’s Pacific coast. This Sheraton resort sits on a sprawling Panamanian beach along the serene Pacific Ocean and has everything you can want for total relaxation. 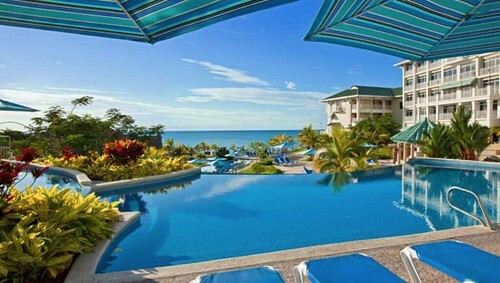 Nestled alongside the stunning beach the resort has 4 restaurants ranging from traditional Panamanian to Mediterranean to Japanese cuisines, a private beach, golf courses tennis courts, water sports, game room and kids club. The well-appointed rooms are 100% smoke free and have a balcony or terrace, all featuring breathtaking views of either the Pacific Ocean or the lush mountainside. Each room features the plush Sheraton Sweet Sleeper™ Bed. A complimentary breakfast is served each morning. Services include massages, facials, body scrubs, and body treatments. The ocean view spa is equipped with a sauna. A variety of treatment therapies are provided, including hydrotherapy. 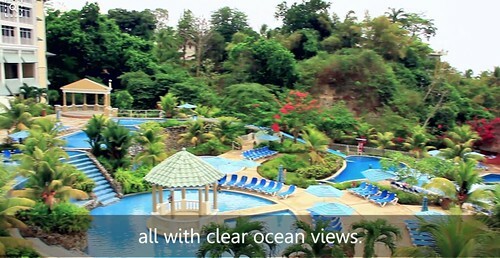 Learn Spanish at the all-inclusive Sheraton Bijao Beach Resort on Panama’s Pacific coast. Super Spanish teacher, Rick Brown, will be teaching this Super Spanish course December 5-6-7, 2017. Here is a special offer from Panama. Our site focused on the benefits of living in Ecuador for many years, but we have always had many readers ask about Panama. That’s why we have worked closely with Jackie Lange at Panama Relocation Tours. When Jackie suggested that Rick Brown conduct a Super Spanish courses right after her Panama Relocation Tour, we arranged the course for our many readers who had always wanted to check out Panama. We have had a lot of interest (and signups). Here are the delegates at the last Panama Super Spanish course. Now the opportunity is better because Jackie Lange sent this special offer. Gary, I just sent out a promotion to my subscribers that I will give them $100 off per person on our Panama Relocation tour if they also register for the Learn Spanish in 3 Days class. Within 5 minutes I got 1 couple and 1 single person signed up for the tour. They both said the Spanish class was the icing on the cake! My December Panama Relocation tour is December 9-14 and the Super Thinking, Super Spanish seminar runs just before the tour, so it is perfect timing to add 3 more days for your class. You are welcome to extend that same offer to your subscribers. If you have always wanted to get to know Panama and learn Spanish as well, this is the perfect opportunity, and you can save an extra $100. Get full details on how to save $100 per person on the December Panama Relocation Tours here. There is longevity in positivity. According to an article in the Journal of Personality and Social Psychology entitled “Positive emotions in early life and longevity: Findings from the nun study: by Danner, Snowdon and Friesen”, positivity can have an impact on longevity. A strong inverse association was found between positive emotional content in these writings and risk of mortality in late life. As the quartile ranking of positive emotion in early life increased, there was a stepwise decrease in risk of mortality resulting in a 2.5-fold difference between the lowest and highest quartiles. This is also why we use Baroque Music in the Super Thinking sessions at all our seminars and courses. Super Thinking creates a state of relaxed concentration and reduces stress. But one might ask how does this work. An article at womenshealth.com entitled “Negativity and Your Health – How Stress Can Make You Sick” says: Stressful environments. Jobs that impose high demands for output of services or products but allow workers little control over how those demands are met have been termed high-strain jobs. Psychologists Robert Karasek, PhD, of the University of Massachusetts, and Tores Theorell, MD, PhD, of the Karolinska Institute in Stockholm, Sweden, have documented that people working in high-strain jobs are more likely to develop high blood pressure, infections, and job-related injuries, as well as heart disease. If true, this theory could point to the brain’s serotonin system as a key neurobiological mechanism that regulates our ability to be in control. Two studies have found weaker brain serotonin function in persons with lower income and education levels. In his most recent research, Redford has begun to study how genes that are involved in regulation of serotonin affect all of these health-damaging psychosocial, biological, and behavioral characteristics. An article at classicalforums. com entitled “Effect of Classical Music on the Brain” helps us understand the connection between baroque music and serotonin. Here is an excerpt (bolds are mine). In fact depression is a consequence of the scarce production of this hormone. Serotonin is released when the brain is “positively shocked”. For instance: if we look at a splendid painting, smell a delicious scent, feel an extraordinary sensation, eat something delicious or listen to some charming music, then the brain lets off a certain amount of serotonin which arouses and maximizes pleasant feelings. Music’s rhythm can also stimulate other natural cadencies of the body, resembling the heartbeat, or the Alfa-rhythm of the brain, and this effect is used to counter the development of clinical depression. The melody instead, is the “sparkle” that catalyses the creative process in our minds. Music opens our awareness in different ways depending on the type of music. I am not sure anyone knows entirely why… but music has been used by cultures almost since time began. The use of music can run from romantic to a military march to patriotic songs to music that helps us exercise better. One fact about music that is known is that certain types of music affect humans in the same way regardless of color, race, religion. Sad music can make all people sad. Happy music can make all people happy! To gain from these facts, Merri and I listen to 60 beat ten cycle classical music… recommended by Dr.Georgi Lozanov, the great Bulgarian educator. Here are some ideas and music that could improve health and intelligence. The system Lozanov utilized is three types of music in three phases to enhance absorption, retention and recall. Next, an active concert is heard. At this stage, the information to be learned is read. For example, here are some ideas and music that can improve your health and intelligence and how I would research some new idea or study something new. Being positive is good for creativity, happiness and longevity… whenever you work or learn, it’s a good idea to find a way to gain super thinking and positive good health! Join the top 3 percent of intelligent people in the world. Become more independent and relaxed by becoming smarter. A study of 10,000 British people studied the pure relationship between intelligence and happiness stability. IQ can predict the emotional ups and downs of life. The research found that the lower the IQ, the more stress and higher the ups and downs in life satisfaction. The differences were not due to education, income, or jobs either, but simply IQ. Delegates at a Super Thinking course relaxing in their secret rose garden. 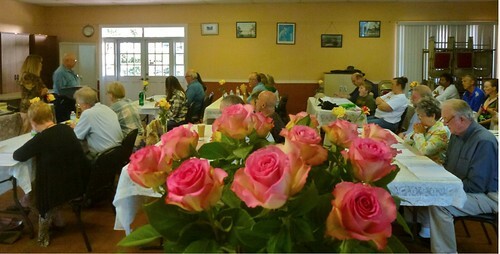 Free yourself by becoming smarter, healthier, happier… in just weeks… hearing a relaxation session that takes you into your secret rose garden. Merri, David and I originally developed this session for our Super Thinking courses and have set it into an online workshop for you. Listen… just 18 minutes day. We guarantee your life will be better. When it comes to money… inflation is cheating. When it comes to intelligence… inflating is smart… fair… good for you and it’s good for the rest of the world. Monetary inflation is a sneaky government and business trick. What cost a dollar in 1965 can easily cost $15 now. They devalue the currency so you get more dollars that buy less. They can rip off your salary, your pension…raise insurance, almost everything. And they make you work harder… longer… for less. Whittle, whittle, whittle. Push, push, push. That’s what monetary inflation does to you. Fight back… overcome the inflation trick. Inflate your IQ as you relax. Be smarter… more energetic…. healthier… more relaxed. That’s the way to get ahead! Create more income opportunity. Reduce stress. Improve your health. Be naturally smarter… use Super Thinking. You can improve your IQ in just weeks. You might well ask… How is this possible? Here’s how the scientists say it is possible. Many people think of IQ as a genetic trait, like brown eyes or short legs: You’re born with it and you’re stuck with it. Now, a growing body of research is showing that a person’s IQ can rise—and even fall—over the years. Scores can change gradually or quickly, after as little as a few weeks of cognitive training, research shows. British students were given IQ tests and brain scans at ages 12 to 16 and again about four years later. 9% of the students showed a significant change of 15 points or more in IQ scores. The study published in Nature said that on a scale where 90 to 110 is considered average, one student’s IQ rose 21 points to 128 from 107, lifting the student from the 68th percentile to the 97th compared with others the same age. MRIs in this study showed changes in gray matter in areas corresponding to fluctuations in the kid’s skills. There are practical steps people can take to see longer-term IQ changes. New tasks stimulate the brain most. Young adults given just one month of intense training in juggling, found an increase in the corresponding gray matter in the brain as early as seven days after the training began. Fluctuations in IQ scores over time underscore the brain-boosting benefits of musical training and new experiences throughout a lifetime. Music lessons are linked to higher IQ throughout life. Six years’ lessons lifted children’s IQ scores an average 7.5 points. Improve the brain through music… without lessons. The educational program Merri and I developed uses a form of brain wave integration that increases IQ. Super Thinking uses frequency (in music and a number of other ways) to integrate brain waves so the process of absorbing, processing and recalling information is vastly accelerated. The music creates the three C’s: Calm, Clarity and Coherence. This Super Thinking program is not a gimmick or trick… just advanced education. Certain types of Baroque music are the base, and they make you smarter! At least four best selling books, “Psychic Discoveries Behind the Iron Curtain”, “Superlearning”, the “Mozart Effect” and “Superlearning 2000″ showed how to learn and think more powerfully based on systems drawn from the Bulgarian educational master, Dr. Georgi Lozanov. This Baroque music tactic alone is so powerful that Small Business Innovation Research… an official site of the US government granted over $100,000 for the specific purpose they said was: to provide a method to remove barriers which hinder or prevent the employment of blind persons. An innovative method, the Lozanov Learning System, is proposed to help train blind persons to become computer programmers and operators of automated equipment. Merri was among just a few who learned this technique directly from Dr. Lozanov the time he visited the USA. Our Super Thinking workshop enhanced this system with numerous other tactics. We added slight alterations in nutrition that create a higher IQ. Altered nutritional tips in Super Thinking can make anyone 25% smarter! Baroque Music and nutrition are just part of seven, easy to use, learning techniques that make you smarter. Gain any skill, from computers to athletics to conversational languages…in less time…two-to-five times faster. Here’s a huge bonus. Super Thinking also relieves stress. Super Thinking is fun. You can use a Super Thinking focus in everything: health… earning… education… investing. Super Thinking works on the learner first…the data second. This system “grows the learner” rather than the information. If you have 4.5 inches of information flowing through a 4 inch learning pipe, the solution is not to add another inch of information. The answer is create a six inch IQ pipe! Share our years of experience. For nearly 50 years, Merri and I have conducted hundreds of courses and tours for tens of thousands, in dozens of countries (even behind the Iron Curtain). Our Super Thinking Workshop has been one of the most profound. Now the workshop is even better online because it condenses Super Thinking so you can increase your IQ, at home… right away. The workshop shows how these mind expanding tactics can be applied to starting and running a business for extra income, to forex trading and investing. Athletes of all types… golfing being one common sport benefit. Our Super Thinking plan goes far beyond Lozanov and allows you to rapidly get smarter in every part of your life. 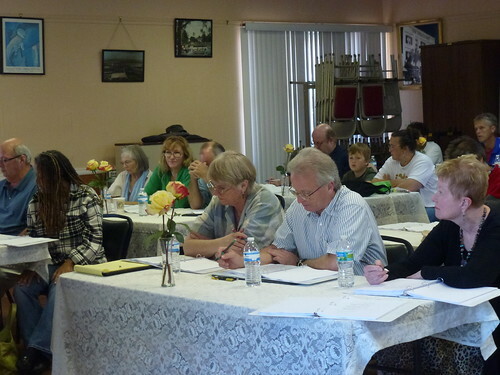 For example, real estate broker, Suzy Kurinsky took the workshop to help her learn Spanish. Super thinking can improve almost anything you do… faster, better, more fun and with less stress. Another attendee to the Super Thinking Workshop sent this note. Thank you for the wonderful workshop on Super Learning + Spanish! I really enjoyed the workshop and getting to know you. I can see several ways to apply what I learned in the classes I teach. Super Thinking can help improve your health. Super Thinking can make you rich and add richness to your life. However the time, travel expense and workshop cost (delegates have paid up to $999) have prohibited many from getting this benefit. That’s why we have created the workshop in electronic form. Get Super Thinking online for less than fifty bucks. Relax in the Secret Rose Garden. The workshop is divided into two parts. Part one is the application… the sessions that tell you exactly what to do, what music to use and even includes two recorded sessions based around a secret rose garden that you can use. We have kept this portion short and simple so you can easily start immediately. Part two is a longer portion on theory. Super Thinking is like jogging… giving results if you simply do it! You do not have to know why Super Thinking works to increase your IQ. But Part Two explains why you are getting the good results from Part One, if you want to know. You might ask…”Will it work for me”? The Super Thinking Workshop will help increase your IQ. I guarantee it. Order the Super Thinking Workshop. Use it for two months. If you are not totally satisfied… in any way, during that time, simply let me know and I’ll send a full refund… immediately… no questions asked. Another Super Thinking workshop attendee wrote: Listening to the two of you during our time together has suddenly got me to thinking, and although some of the ideas still seem foreign to me, I am at a point in my life now where I can say, “anything is possible”. I am now willing to embrace and allow myself to experience the world of possibility and let it take me in directions I may have in the past resisted. I really don’t know where all this is going to lead me but I am now willing to explore, develop and grow. Thank you again for a wonderful four days!! Inflation is a cheat… a crime when it comes to money. Inflating your IQ to beat inflation is simple good sense. Learn Super Thinking now with no risk. Begin to increase your intelligence today. Order the online Super Thinking Workshop $49.95. Tzimon Barto is a genius. To gain success, be around success. Humans are like tuning forks. When we are around success, we pick up successful habits and thoughts. When you know what you want… get near those who are like what you want to be. Merri and I use Largo music in our Super Thinking plus Spanish courses and Writer’s Camps to help attain a state of relaxed concentration. Two Largo movements I like and use are Chopin Prelude No. 4 in E minor (Largo) and Prelude No. 9 in E (Largo) by Tzimon Barto. This is why we will not miss the upcoming Tzimon Barto Prize March 29, 2014. Tzimon Barto a local bodybuilder who works out at a gym in Umatilla Florida near our home. He also speaks five languages including ancient Greek. He’s the author of several novels and a body of poetry. He’s the founder of a program at the local school to teach first-graders music, art and ancient Greek. He also is a concert pianist of international fame having been discovered by Christoph Eschenbach, when he was the music director of the National Symphony Orchestra. Barto spent five years at New York’s Juilliard School and has since performed with almost every major philharmonic orchestra around the world, including the Philadelphia Orchestra, the Chicago Symphony, the Berlin Philharmonic, the London Philharmonic, L’Orchestre National de France and the NHK Symphony Orchestra in Japan. He is recognized as one of the most important American pianists of his generation, performing to packed halls of faithful fans with solo, orchestra and chamber music concerts. His numerous recording for EMI include concerti by Ravel, Prokoviev, Rachmaninov, Liszt, Chopin and Bartók, Gershwin, and solo recitals of works by Chopin, Schumann, and Liszt, as well as a disc of popular encores, featuring music ranging from Bach to Joplin. Four recordings for Ondine feature piano pieces by Rameau, Ravel, Hayden, and Schumann. 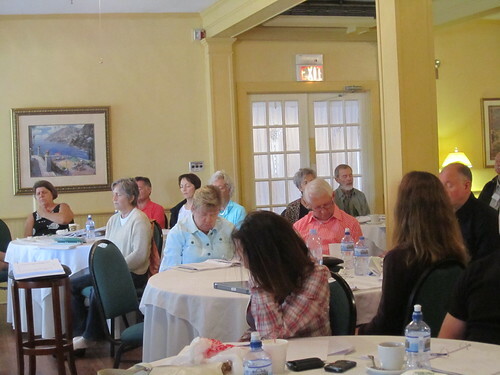 We have conferences in the seminar hall from the Lake Eustis Institute which organizes a special bi annual composition event for Barto that is held in small town USA, Eustis Florida. 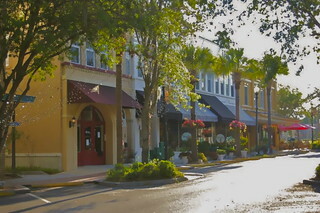 The prize originates not from a major musical metropolis but from this small central Florida town! Developed by classical pianist Tzimon Barto and the Lake Eustis Institute, the biennial Barto Prize is publicized at music schools and related institutions around the world. In early spring, a year prior to the prize award, information packets are mailed to international and national music schools and notices are posted on composers’ electronic bulletin boards notifying composers of the upcoming event. Bright Sheng, a member of the composition faculty at the University of Michigan, where he now serves as Leonard Bernstein Distinguished University Professor of Music. Sheng was commissioned by President Clinton for a piece that was played at a White House state dinner in honor of the Chinese premier by Wu Man and Yo-Yo Ma. Augusta Read Thomas is an award winning composer and member of numerous music boards and advisory boards. The winner of the prize this year is Italian composer, Daniele Gasparini, with the composition “Tres recuerdos del cielo” based on Spanish poet Rafael Alberti’s poem of the same name. 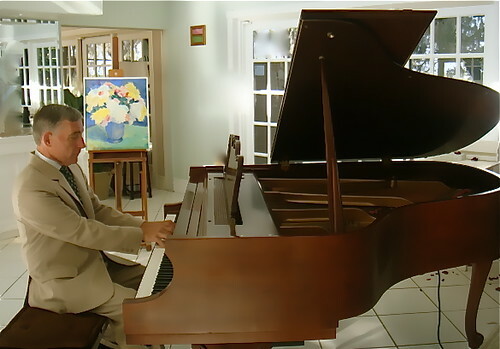 Daniele Gasparini’s compositions have been performed in Europe, the United States, Canada, Israel, Australia and China. His works have been performed by the London Symphony Orchestra, the Orquesta Sinfonica de Radiotelevision Espanola, the BBC Orchestra, and the Pittsburg Symphony among others. His works are published by EMI Music Publishing, Casa Musicale Sonzogno, and are recorded by EMI, MPS, Ars Public and others. 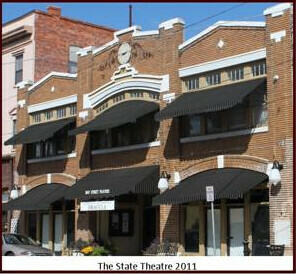 The performance is even more special as the venue is in the Bay Street Players Historic State Theater in Eustis. 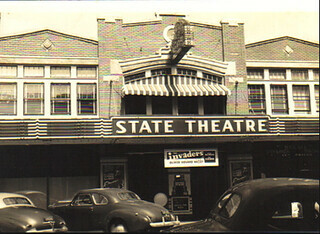 In 1975 began renovation of the vacant State Theatre building and have been bringing live performances to Eustis in this cozy, historic location. The Fifth Biennial Barto Prize Concert will be conducted Saturday March 29, 2014. If you are anywhere near central Florida at that time, don’t miss it. Learn Spanish with FM & Football. Wanna win the Superbowl? Wanna speak Spanish in four days? The path to both these accomplishments may be the same… with frequency in the form of Baroque largo music. In these days of rapid change and growing competition, we need every advantage we can have to keep up and get ahead. This is why it is important to know the learning benefits that come from listening to Baroque Largo music. I play music to gain inspiration and change my mood. I’ll explain what learning Spanish and winning the professional football have in common in a moment. First, here is what delegates at our last Super Thinking Plus Spanish course had to say about frequency modulation. Delegate #1: Hi Gary and Merri, I wanted to let you know how much I enjoyed the recent Teacher Training and Super Thinking + Spanish Class. The teacher training is exactly what I have been looking for to take my work to the next level. Much love, and see you in February. Delegate #3: It was a great pleasure to participate in the last course. You and Gary are such wonderfully giving hosts and teachers. I did enjoy meeting everyone and I am glad to be coming back, soon. 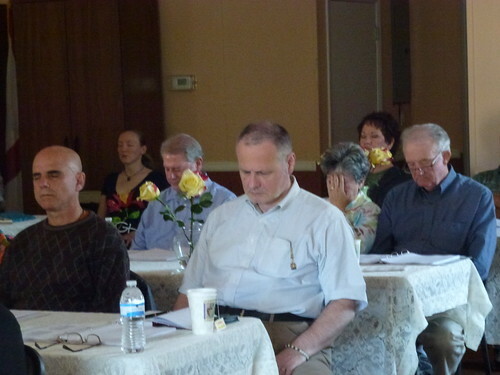 In my opinion, we had a terrific collection of attendees and a great teacher trainee group. Delegate #4: First of all, I want to thank you for all your input on so many topics outside of “Spanish” that added a wonderful dimension to the weekend of learning for me. I have to tell you, on the ride home, I was thinking in headlines, such as, “How to Restore Your Memory in a High Stress Age”, or, “Afraid of Memory Loss in Your Future?”, and another, “Expand your mind with Music, Meditation and De-Stressing!” I felt though I had to focus on “nothing”, so I could worry about “nothing”, think about “nothing” and yet I could absorb everything, learn anything and grow exponentially. My mind is refreshed, and believe it or not, somehow I feel like I have regained faith. It is evident I have much to learn and much to gain from our association. It is my sincere desire that I can add a little grain to the future of ‘Ecuador Living’. Thanks again. Delegate #5: Ola Merri Escott. Pensando Super nos ha encontrado una nueva forma de aprender español. Ahora ver los programas infantiles en la televisión española. 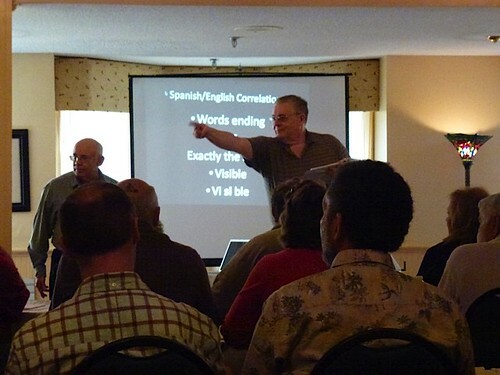 Barry & I need to know the infinitivos better in order to speak better spanish….but the best part of the course is that we are able to recognize so many written & spoken words therefore our ability to read and understand has grown exponentially. Our friends are becoming quite tired of us “speaking” spanish around them. What a joy it was to be in the presence of The Scotts! Thank you for the experience. We hope you see you in the NC mountains soon. Our Super Thinking Plus Spanish uses frequency modulation to help delegates are able to communicate in Spanish in just four days. One part of the frequency modulation uses Baroque large music. You’re at Jets training camp. Instead of blasting hip-hop, rap and hard rock on their sideline speakers at Hofstra, a tradition that began last summer with the arrival of innovative coach Eric Mangini, the Jets have altered their play list, mixing in classical music-namely Mozart-with their old standbys. It makes for an almost surreal setting: 300-pound men crashing into each other, with gentle melodies in the background. It’s a ballet of behemoths. The ever-meticulous Mangini, always looking for a psychological or physical edge, isn’t playing classical music to entertain the 3,000 or so fans who show up every day to watch practice. There’s a method to his Mozart. So will Mozart help Chad Pennington read an oncoming blitz? Who knows? But Mangini is willing to look outside the box to find ways to win. Another example: In the offseason, he hired noted fight trainer Teddy Atlas to give boxing lessons to the players, hoping to improve their hand speed and placement. “He wants to get every legal advantage he can get,” tight end Chris Baker said yesterday. The Jets usually play Mozart during the low-intensity drills, when the team splits up into individual units and the coaches are stressing mental work over physical. In team drills, when the speed picks up, they crank up the music, blasting everything from rock to rap. They do it to simulate crowd noise, forcing the players to increase their concentration amid the ear-splitting din. The Jets did not win the Super Bowl that year. They did however go from a 4-12 record to an 8-3 string and make the playoffs the next year. It could also be that the coach did not really understand the Mozart Effect because it is a misnomer. Most of the correct baroque music that works to integrate brain waves for better performance is not Mozart. The “Vivaldi Effect” or “Handel, Corelli or Bach Effect” would be a better phrase. The key to using Baroque music is that it helps stimulate a mental emotional state called “Relaxed Concentration”… a state that helps better absorb… retain and recall information. Frequency modulation is of five tactics in our Super Thinking course. To learn more read below. Our world is filled with rapid change and growing competition. There are more reasons than ever before to speak Spanish can help us keep up and get ahead. Whether you learning Spanish or not, when you want to learn… listen to Baroque largo music. This may not get you to the Super Bowl… but it will improve your learning ability. New Ecuador visa regulations passed in January 2011. It appears that Ecuador resident visas are now much easier to obtain. 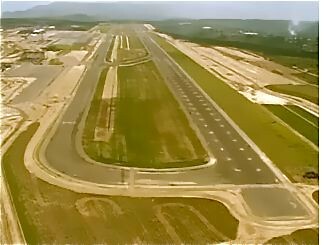 Quito’s new airport… new air port coming… new visa regulations are already here. Learn about the new Ecuador visa regulations here.